It’s time for a sprinkler system checkup! With the hot weather just around the corner, it’s time to fire up the sprinkler system again! For most of us, it’s been a long time since we’ve run our sprinklers and turning on your system may reveal a few surprises since the last time you watered the lawn. That may necessitate a few repairs to get things in working order. Before your neighbor has to be the one to tell you that water is shooting up in the air, do a check on your system. Turn on your sprinklers and take a walk around your yard. Be sure sprinklers are aimed at watering grass, not concrete. Adjust spray heads. On top of each spray-type nozzle is a small adjustment screw. Turn the adjustment screw to adjust each of your spray-type sprinklers so that they don’t spray onto sidewalks or walls. Check the irrigation clock to make sure it has been reset and the timer is. Most folks tend to overwater because the clocks have not been checked since the day they were installed. Think about taking five minutes to make sure your clock operates properly. Be sure your clock is set to water before 10am and after 7pm. Clean clogged sprinkler heads if water is not flowing evenly. These can easily become clogged with dirt over the winter months when not in use. Replace broken or cracked sprinkler heads. This is where water is very quickly wasted! Here is a simple do-it-yourself guide. 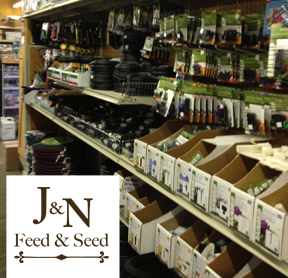 Stop by J & N Feed and Seed. We have sprinkler heads and everything you need to get your watering system, hoses and lawn in tip top shape! This entry was posted on Friday, April 13th, 2018 at 10:57 am	and is filed under Garden, News & Updates. You can follow any responses to this entry through the RSS 2.0 feed. Both comments and pings are currently closed.